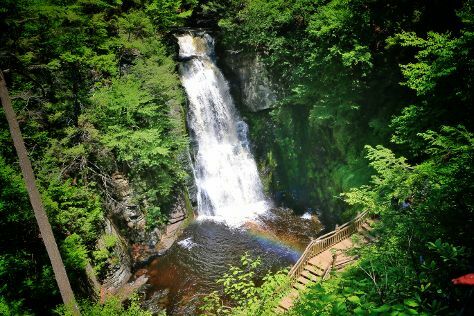 Explore hidden gems such as Cupsogue Beach County Park and Bushkill Falls. Give yourself a bit of retail therapy at Golden Fish Gallery and SteelStacks. You'll find plenty of places to visit near New York City: Peters Valley Gallery (in Layton), Hawk's Nest Highway (in Port Jervis) and Sam's Point Preserve (in Cragsmoor). Next up on the itinerary: explore the activities along Upper Delaware River, identify plant and animal life at Kettle Creek Environmental Education Center, explore the landscape on two wheels at Dutchess Rail Trail, and head outdoors with Shawnee River Trips. Take the guesswork out of planning a New York City vacation by using our trip itinerary maker. Jerusalem, Israel to New York City is an approximately 16-hour combination of flight and bus. You can also fly; or do a combination of flight and train. The time zone difference moving from Israel Standard Time to Eastern Standard Time is minus 7 hours. Expect slightly colder temperatures when traveling from Jerusalem in September; daily highs in New York City reach 31°C and lows reach 22°C. Finish up your sightseeing early on the 15th (Sun) so you can travel to Los Angeles. Eschew the tourist crowds and head to Silver Strand Beach and Tehachapi Mountain Park. Take a break from the city and head to Nicholas Canyon Beach and Rincon Bike Trail. You'll find plenty of places to visit near Los Angeles: Malibu (El Pescador State Beach, Carbon Beach, & more), Canine Creek Dog Wash & Pet Boutique (in Tehachapi) and Ventura (Ventura to Ojai Paved Bike Path & Ventura City Hall). There's still lots to do: take a tour by water with Boat Tours & Water Sports, admire all the interesting features of El Pueblo de Los Angeles, Head underground at Bronson Caves, and stroll through Mt. Pinos. Use Inspirock's suggestions to plan your Los Angeles trip and find the best activities and attractions for your vacation. Fly from New York City to Los Angeles in 9 hours. Alternatively, you can do a combination of bus and flight; or drive. Traveling from New York City to Los Angeles, you'll gain 3 hours due to the time zone difference. In September, daily temperatures in Los Angeles can reach 34°C, while at night they dip to 22°C. Wrap up your sightseeing on the 25th (Wed) early enough to travel back home.